Several weeks ago when Brad and I spent the weekend at Mom's house sewing all of our nursery decor (a recap on this sewing loveliness is next... promise! 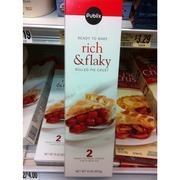 ), we had quiche for breakfast. I didn't realize just how much I love quiche until I've experienced it multiple times throughout my pregnancy. Okay, so you get the point. 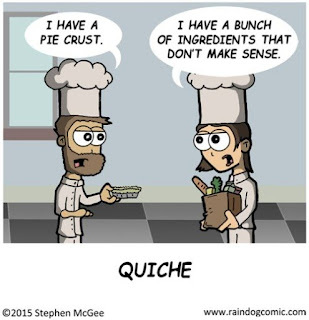 I pretty much love quiche right now. Well Mom made us quiche for breakfast with asparagus and lobster bits. Can you say... YUM? (oh and we had a side of bacon, because I love bacon just as much even more than my new found love of quiche). She basically whipped up a few ingredients, popped it in the oven and vua-la! ...Amazing quiche was cooked and ready to eat. Well, making a whole quiche pie seemed like it was too much for Brad and I to eat alone (I know, I know - too much food for this pregnant lady?). So, I decided I wanted to make my quiche in ramekins. Usually when we bake/cook pies, we like to bake smaller portions so that we don't feel forced to eat the entire pie in one day. I bought pie crust from Publix and lined the ramekins with the crust. Combine eggs and milk and whip until blended. Add additional ingredients, mushrooms, asparagus and cheese. Place directly in the oven and bake 25-35 minutes, this will vary depending on the size of your ramekin. Check the center of the quiche if it is still wet looking cook a few minutes longer until set. Remove from oven and cool for 5 minutes. Serve the ramekin on a plate with fresh fruit bacon! PS - the easy thing about this recipe is that you can pretty much mix any ingredients that you want. Making the ramekin size quiches allows you to customize your ingredients and let others be involved in the cooking/mixing process.